Johann Sebastian and State of the Union return with their 3rd full length album, Evol Love Industry. 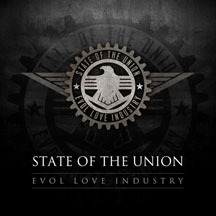 Showcasing State of the Union's signature sound, Evol Love Industry mixes hard-hitting electronic beats with haunting ballads and symphonic orchestrations. Tracks like "Dead Serious", "Fall From Grace" and "Radioman" makes Evol Love Industry their most club accessible release to date. In addition to the 10 album tracks, Evol Love Industry contains an additional four mp3 tracks, including a remix of Fall From Grace, and an mpeg video for the song RadioMan. The bonus features will only be available on the CD which makes this release a must have for fans of State of the Union or fans of EBM/Electro.